How to create fountain animation in 3DS MAX? How to move the flow of water ? How to animate a backlight of water? Watch the video and learn the answers to these questions. \SAMPLES\ - here you will find samples of water pictures which we use in this tutorial. \TEX\ - set of textures used in this tutorial. FTools.script is fully compatible with the scanline renderer only. However, it is very easy to combine it with any other renderer. Please note that we use a photo in this tutorial. That is, basically it does not matter what render you use and what picture you use as the background. A zipped file attached to the tutorial on dynamic fountain animation contains images that we will use as the background. In order to get them, we must first process the image. Trim it in the desired proportions. Create day-time and night-time versions of the image. 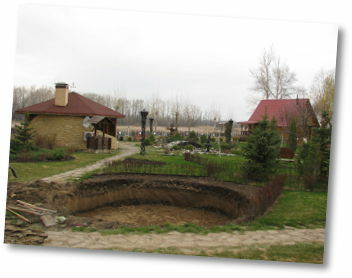 Then load the picture into the scene with a fountain. Set up the camera so that the virtual camera view point coincided with the point of view of a real camera. Render the fountain over the image. In our case we made two visualizations. Day-time and night-time. Cons of using photos – static scene. Water surface is static on the picture and it looks unnatural and striking. But it is very easy to avoid this. But, it is very easy to avoid. We visualize the water ripples in a separate sequence of frames and will continue to use is not a static picture, but as a sequence of frames in which the water surface is moving. It is very easy to render the water ripples animation over the picture. It adds realism to our animation. Download the zipped file attached to the tutorial and open the scene titled FTools.script-BG.max. This scene contains the fountain visualization over the photo from the previous step. Please note that in this scene a rendered fountain is used as the background, over the photo. 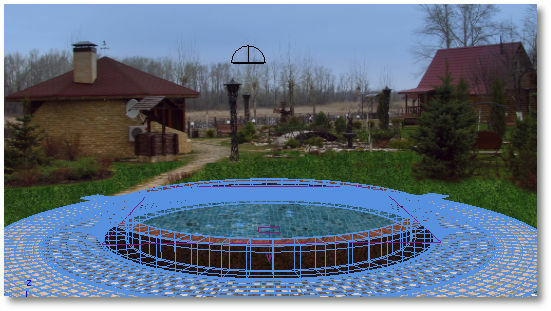 In this case, all of the objects are applied Matte / Shadow material, except for the water. For water we use a special reflecting material that plays in the sun. Look into the properties of the Matte / Shadow material. This material will be very useful in your work. Set animation duration that you will is necessary. Usually, if the animation lasts 30 seconds, the animation of water surface is set to 30 seconds as well. Specify the directory in which you want to save your frame sequence. Specify the frame extension so that it is the same size as the final animation. You can use a jpg file with minimal compression as the format. In the next step we are going to configure the Matte / Shadow material in such a way that the water surface did not only have ripples and reflections, but also the reflection of our future water pictures. After an animated background is rendered, configure Matte / Shadow material for the water surface. If we leave as it is, then our nozzles won’t be reflected on the surface. 3DS MAX has a tool which allows simulating such reflections. Open a scene titled FTools.script-WaterPatterns.max. A frame sequence is used as a background (it is not attached to the tutorial so that you didn’t have to download big-size files). We use a Matte/Shadow materialas the material of the water surface. If we place any object on the water surface, there will be reflections of it. Now you are ready to create a water picture of the fountain. Make sure that the number of frames is properly configured. If you change this value later, you will have to re-adjust the height of the jets and their animation, respectively. This example uses 25 frames per second. Once the scene and water images are ready, you can proceed to fountain animation. This example shows how to make animation of a dynamic fountain using FTools.script. Turn off the excess layers when creating fountain animation – it will help to save system resources. Watch the life of the particles in the scene. The beginning and end of life of the particles should last as long as the situation requires. Remember that the particles take up a lot of computer resources. If the nozzle is off, it should be set to 0 (zero), Speed and BirthRate. To do this, click >>>0<<< in the animation panel. This greatly saves resources. 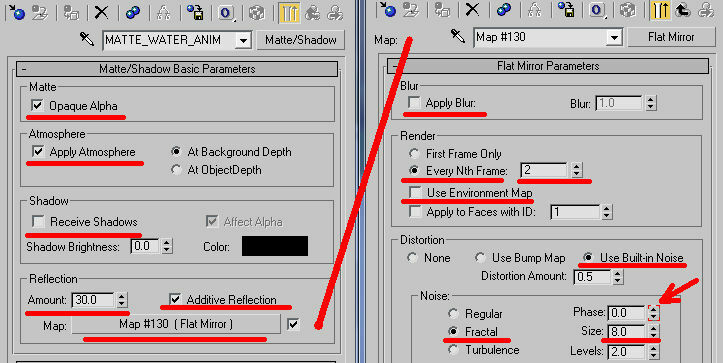 Adjust Matte/Shadow material so that reflections are not calculated in each frame but in each two or more frames. If the animation is smooth, the difference is almost invisible. However, the rendering speed is substantially increased. Always render the particles in the scanline render. In this case, use an image or sequence as the background. Do not render the particles and the environment at the same time. It will greatly slower the process. Be respectful of your time.